Pakistani TV personality and security expert Zaid Hamid spoke out quickly after the Mumbai 26/11 terror attack--and was smeared as a "conspiracy theorist" by the usual suspects. Now that India has learned that most of its "radical Islamic terror" was actually Hindu-Zionist false-flag terror, a growing audience recognizes Hamid as a truth-teller whose views must be respected and heeded. NEW DELHI: Mumbai's 26/11 was actually a plan hatched by "Hindu Zionists" and "Western Zionists", including the Mossad, said a self-styled Pakistan security expert on a Pakistan news television show, uploaded on www.hotklix.com.
" Inki shaklein Hinduonwali hain, jis zabaan mein guftagoo kar rahein hain, woh zabaan koi Pakistani istemaal nahin karta hai (They look like Hindus. 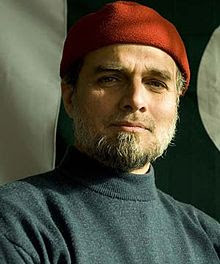 No Pakistani speaks the language they chatted in)," said Zaid Hamid while referring to the terrorists on the show Mujhe Ikhtilaf Hai (I differ) on Pakistan's News One channel. The sensationalist channel was launched in November last year. Hamid said that it was a "badly planned" operation that had gone horribly wrong. "9/11 jo Americans ne kiya tha usko bahut khoobsurat camouflage kiya tha. Unhone media mein perception management bahut acchha kiya . Indians ne wahi game repeat karne ki koshish ki, lekin akal to hai nahin . In ahmakon ne complete disaster kiya isko handle karne mein . (The Americans executed the 9/11 attack perfectly. They managed the media very well. The Indians tried to repeat the formula but goofed up. The idiots made a complete mess of it). He said that the attackers wore saffron Hindu Zionist bands, which no Muslim would tie. Hamid also said that within the first 5 minutes of the attack, the three ATS policemen investigating the network of terror within India's security agencies and radical right were killed. That ensured that those investigations reach a dead end. Anchor Qudsia Qadri added that with their killings, the investigations into the Samjhauta Express carnage would be halted. The killings also immediately shifted attention from India's domestic terrorists to Pakistan, said Hamid. Marvi Memon, glamorous Pakistan Muslim League member, on the same programme, was appalled at the Pakistan government's expansion of the "India-appeasement package" by initially agreeing to send ISI chief to India. "I just don't get it," she exclaimed in exasperation. She wondered how can you send the ISI chief to a " mulk jiske sath jang chal raha hai ...at a different level...," mentioning Kashmir and accusing India of blocking Pakistan's waters. Memon said, "They (Indians) are quite obsessed with anti-Pakistan speak and that unites them," she said. Memon also spoke about India's separatist movements and believed that India was only reaping the bitter harvest of the poisonous seeds it had sowed.